Why Are Backwater Valves Essential? Plumbing issues can lead to costly damage. Although there are many tools available that help homeowners prevent issues related to heavy rain and flooding, many don’t implement them successfully. This increases the risk of property damage and can impact your entire home. The use of backwater valves is an effective way to protect your property. By understanding how backwater valves work and the best ways to use them, you’ll reduce the risk of flood damage and protect the value of your property. When homeowners face heavy rains and flooding, one of the most common issues that arises is the backing up of sewage into toilets and sinks. For many, repairing these issues requires significant spending and presents health risks due to the presence of raw sewage. Backups occur when the area’s sewer lines aren’t fully functional. Many local governments have taken steps to keep main lines clear, but this may not always be effective when facing a significant level of rainfall. Backwater valves work to protect you from facing costly water issues and ensures that your property remains protected against flooding. Backwater valves work by automatically blocking sewage from the sewer line when the water backs up. These valves are placed in the sewer lateral, which connects your property to the main sewer line. These devices are also referred to as check valves or back-flow prevention devices. They allow the flow of water to move out of your home towards the main sewer line. Backwater valves must be inspected and maintained regularly to ensure that your home is protected. In order to use a backwater valve in your home’s sewer system, you need to find out what type of valve is ideal based on the recommendation of your local government. Also, backwater valves must be installed by a professional. You can obtain a list of approved plumbing specialists from your city government. Plumbing permits may also be required before installing a backwater valve. Foundation drains should not be connected to the sewer line when installing a backwater valve. The use of a sump pump or sump pit can allow you to disconnect drains and downspouts before installing your backwater valve. 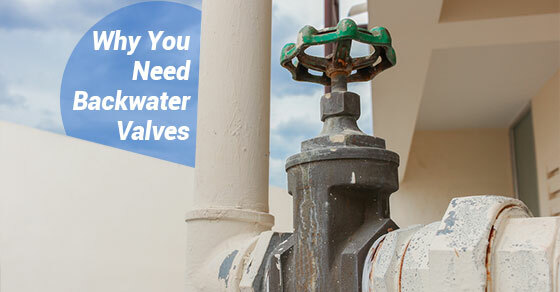 Many of today’s building codes specify the need for a backwater valve installation. The first step you should take is to check with your local plumbing codes and building inspectors to determine the best options for your needs. A high-quality backwater valve plays a critical role in protecting your home against costly plumbing issues. These devices prevent the backup of water in your home and reduce many of the associated risks. Using a backwater valve is an additional component in providing you with the peace of mind in knowing that your home is protected against water damage.